APPLE HAS ADMITTED to a battery life fault affecting the iPhone 6S and iPhone 6S Plus handsets. 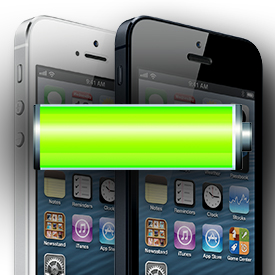 The problem, which occurs when the time or time zone on the handset is changed manually, sees the iPhone's battery percentage level stop updating, fooling owners into thinking that they have more juice left than they actually have. With this in mind, we've rounded up six of the best tricks for extending the battery life of your iPhone as, let's be honest, even without this latest problem, the Apple smartphone isn't known for its stellar battery capacity. The iPhone 6S has almost as many pixels as an 11in MacBook Air with its 4.7in 750x1334 326ppi display, so it will come as little surprise that the screen is the biggest drain on the battery. You can change the vibrancy of the display to get around this. A quick way is to turn down brightness using the slider in Control Centre, accessed by swiping up from the bottom of the display. You should also go to Settings > Display and Brightness to make sure you have the Auto Brightness feature switched off, as this will stop your handset cranking the brightness levels back up. Parallax is a feature introduced in iOS 7 that adds depth perception and 3D effects to the iPhone's display. This makes some people feel seasick, but it's probably also having a detrimental effect on battery life given that it constantly uses your iPhone's graphics processor. Thankfully, it can be switched off. Go to Settings > General > Accessibility > and switch on Reduce Motion to temporarily turn off all the parallax effects. One of the biggest battery draining features of any smartphone is the location-tracking crap that apps load onto them. If you want to save some extra juice - and your privacy - this feature can be switched off by going to Settings > Privacy > Location Services. If there are some apps you want to be able to use your location, such as Apple Maps, there's also the option to switch off the feature on a per-app basis. Yep, we all do it, but quitting all of your apps from the multitasking menu doesn't actually increase battery life. When you do this - by double tapping the Home button and swiping upwards on open apps - it means you take it out of RAM, which in turn means that when you open it again the iPhone has to load it back into memory. Disabling Notifications is an obvious way to extend your battery life, and you can do so by simply placing your iPhone 6S face down on a surface. As soon as you do this, iOS 9 stops the screen lighting up when you receive a notification of any kind. You will be notified instead via sound or vibration. Apple introduced a new feature in iOS 9 called Low Power Mode that promises to take some of the pain out of trying to extend your iPhone's battery, and the firm claims that it will provide three extra hours of life.